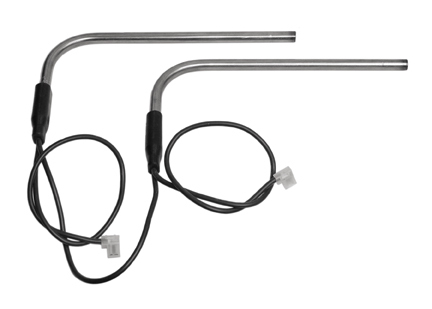 This is a set of 2 Brand-New aftermarket replacement Dometic AC 120v 210 watt Heating element for several Dometic models. This element will fit the RV Dometic two door Side by Side Refrigerators. With AC elements wired in series. This listing is for 2 brand-new Dometic aftermarket replacement AC heating element. This 210 watt AC element fit various models of Dometic Refrigerators. All the Dometic side by side refrigerators. The Dometic side by side refrigerators uses 2 AC heating elements. Dometic elements normally sell from $59.00 to $70.00 each from your RV Dealer. RV Cooling Unit Warehouse keeps the Price Down with low warehouse prices and free shipping. When the AC mode on your refrigerator fails, check if AC voltage is going to the element & with no heat, element is bad an must be replaced or when you are replacing the cooling unit an the element will no slide out. Element may not look same as picture. The wattage, size, voltage, amp draw will be correct.